It may have been this vaccine (pdf). It’s unclear which ingredients they were referring to. The product contains a number of ingredients that may be used to raise concern among those unfamiliar with their role in vaccines and the principle that the dose makes the poison. In fact, in the tiny amounts in vaccines (pdf), none of these ingredients is toxic (pdf). In the trial, the parents’ lawyers apparently claimed that the right to health, included in the preamble to the Constitution of the Fourth Republic, clashes with the two provisions mentioned above. France, like many countries in Europe, has a specialized constitutional court, the Constitutional Council–Conseil Constitutionnel–since the establishment of the Fifth Republic in 1958, but until recently, the role of the Council was limited to abstract review of statutes. After a statute was enacted but before it was promulgated (the official act of publication that gave it force), a small number of actors–the President of the Republic or of one of the legislative chambers, or, more commonly, 60 members of the opposition of either legislative house, the Senate or the Assembly, could challenge it before the Council, which would review its constitutionality. We call this abstract review because it’s not in the context of a concrete case. The Fifth Republic’s Constitution did not include a bill of rights, but in 1971 the Council read in two texts enshrining rights: the 1789 Declaration of Rights of Man dna of the Citizen and the preamble to the Constitution of the Fourth Republic, which did include a bill of rights with social rights, including the right to health (). Since then, the Council has required statutes to respect these Constitutional Rights. Since 2009-2010 he Council is no longer limited to abstract review. In a new law France created the option of a Question Prioritaire Constittuionelle (QPC), allowing lower courts to direct constitutional questions that arise during a case to the Council. Under this model, if a case before a judge raises a constitutional question the judge is required to stop the case and refer the question to a court authorized to solve it. Other European countries already use a similar system: e.g. Italy or Germany lower courts may directly refer the case to the Constitutional Court (pdf). The French did not go quite as far as allowing low-level courts to refer cases – they added an intermediary step: a lower court facing a constitutional question must refer it to the highest court in the relevant hierarchy: the Cour de Cassation, if the case is a civil or criminal case, or the Conseil d’etat, if the case is an administrative case. The case is put on hold until the Court de Cassation rejects the demand or, if it approves it, until the constitutional issue is resolved by the Conseil Constitutionnel. The Conseil Constitutionnel will have three months to decide from the moment the issue is submitted to it. At this point, the Larères’ criminal case is before the Cour de Cassation, which needs to decide if to certify the question for consideration by the Conseil Constitutionnel. If the answer is no, the lower court will implement the provisions of the law. If the answer is yes, the Conseil Constitutionnel will decide whether the provisions are constitutional. Even if the case proceeds to the Conseil Constitutionnel, the Conseil should uphold the provisions of the law. Second, while I do not, in fact, support a criminal sanction on parents who do not vaccinate, the United States can, and maybe should, consider placing an administrative fine on those who do not vaccinate. Jacobson v. Massachusetts, 197 U.S. 11 (1905), found it constitutional to impose a criminal fine, and has been relied on by numerous other courts. An administrative fine–without creating a criminal record–should create even less of a constitutional issue. It’s important to remember that the right to health in question here is not the right of the parent but that of the child. It’s pretty clear that the current provisions requiring vaccination do, in fact, protect a child’s right to health–it’s not vaccinating that would put the child at risk. No medical procedure is 100% safe, but serious problems from modern vaccines are extremely rare. In this case, the vaccines in question are the diphtheria, tetanus, and inactivated polio vaccine ones. What are their risks? The diphtheria and tetanus vaccines only have, as side effects, local reactions or low grade fever. IPV too carries only risks of local reactions. In contrast, all three diseases are extremely dangerous, and can kill or maim. A child’s right to health works the other way here. The right to health supports requiring the parent to provide the child the very low-risk protection of the vaccines against these dangerous diseases. Any other decision will simply be an error. One vaccine whose absence is glaring from the mandated list, given the recent extensive measles outbreak that killed children in France, is the MMR. The legislature would do well to consider adding it and protecting children from that dangerous disease. I have said elsewhere and still believe that it is inappropriate to impose criminal sanctions on parents who do not vaccinate a child barring special circumstances. With so much frightening and misleading information about vaccines out there, with rates of diseases still low thanks to high vaccination rates, parents choosing not to vaccinate are making the wrong choice, but their culpability is not at the same level as that of a parent refusing insulin to a diabetic child or antibiotics to a child with a treatable infection, or a parent that starves a child. Criminal law is a heavy-handed weapon, and should be limited to exceptional circumstances. I think prosecutors would have done better, in this case, to limit the claim to the clause in the Public Health Code, assuming they felt they needed to respect the legislature’s wishes by enforcing the immunization mandate, rather than bringing a neglect claim. But a clause like art. L.3116-4 that imposed just a fine, without imprisonment–and made the offense an administrative one, rather than a criminal one–makes sense, I think. 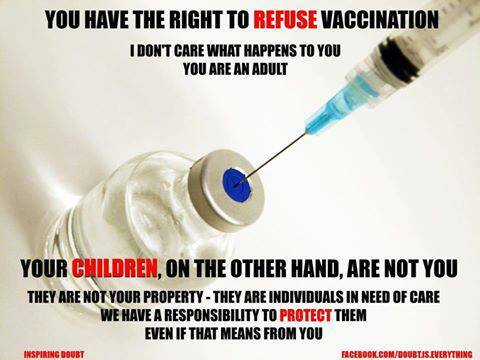 Non-vaccinating has the potential to impose costs on the public. Elsewhere, my co-authors and I discussed ways to recoup such costs to the public purse. We did not directly discuss an administrative fine. But there is always room to learn from other countries. We impose fines for conduct that can harm the public in other contexts. We can do so here by passing a statute authorizing a fine on any family that chooses not to vaccinate without a legal exemption (the exemption discussion is a separate one) – and allow health departments to collect the fine following the usual administrative process to collect fines in that state, either through enforcement via a court or via an administrative process. On 2015 March 20 the French Constitutional Council upheld the constitutionality of a criminal penalty for parents who do not vaccinate. 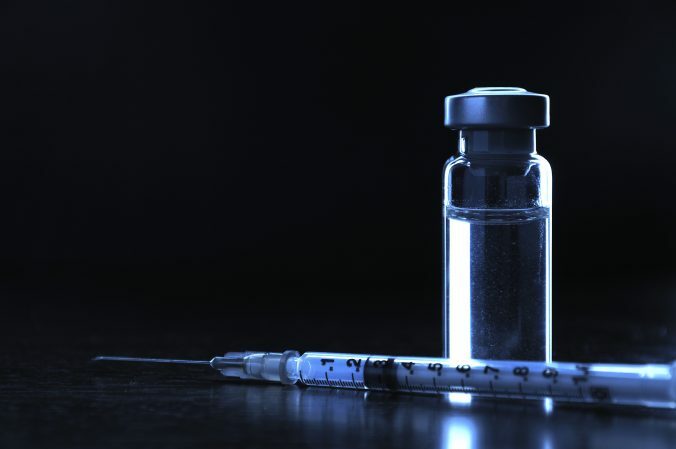 On 7 January 2016, a French court in Auxere, 175 km south of Paris, sentenced Marc and Samia Larere to a two-month suspended jail sentence for refusing to vaccinate their two young children. As stated above, the original offense of not vaccinating their children carried a maximum of two years in prison and a €30,000 fine. Editor’s note: This article was originally published in October 2014. It has been revised and updated to include more comprehensive information, to improve readability and to add current research. Previous PostPrevious Vitamin D review – another overrated supplement?